This is a staple at many gatherings and parties amongst our family and friends. I make it because it's super easy, it presents great and is even tastier to consume! You will find this is so simple and a neat thing to bring along to your next potluck! Best served with tortilla chips or corn chips. You can use whatever toppings you prefer. The great thing about this dip is that guests can spoon whatever section(s) they prefer onto their plates based on what they like or don't like. Brown off the ground beef in a medium skillet. Drain. Add package of taco seasoning and the water called for on the packet. Cook as directed on packet. Add in the refried beans and combine. Remove from stove top. Next, spread bean mixture onto large serving tray or platter. Allow to cool. Then, spread a layer of sour cream (about 10 - 12 oz.) onto bean mixture, leaving a small edge of beans viewable all the way around. Decide what toppings you'd like to use - shredded lettuce, shredded cheese, sliced black olives, some form of red, white or green onion finely chopped and seeded, diced tomato. Using a toothpick, lightly draw out your rings (based on the number of toppings you plan to use) in the sour cream in the pattern of a dartboard. This will be your guideline of where to put your toppings. Then, simply start piling each topping in its own ring ... reserving the diced tomato for the center (or the "bull's-eye"). Serve with a big bag of tortilla or corn chips. NOTE: This can be left meatless. Just mix the refried beans over medium heat in a pan with the taco seasoning and about a 1/2 cup of water. Cook for a few minutes while stirring, then proceed with recipe. Hello from Iowa ! (this looks like a fun dip to serve over the xmas holidays ! Hello, Marilyn! Greetings from Michigan! My husband and I lived in Iowa for a few years while he attended college in Davenport from '99 - '02. We miss it! Thanks for stopping and commenting! I usually make this for the holidays, too, because most of our family gatherings are appetizers and finger foods style. It's one of those dishes that is so easy to throw together, but presents well and gives a major "wow" factor for guests! Happy holidays to you and yours! You'll have to let me know if you give this a whirl! Hello Angela ! Your dip is wonderful.. all your recipes looks inviting! Thank you for stopping back by! I don't think I ever visited Clear Lake ... and, not sure I've heard of it. :) Glad you enjoyed this dip! I appreciate the feedback! This sounds very good and my family is always getting together and this looks so easy and delicious!!! I think i would add a layer of "taco meat" to it too!!! Yummy!!! Oh yes I am from southeastern Iowa!!! I add meat when I don't have to worry about vegetarians. :) It is great both ways. And, hello out to Iowa! I so miss it there! :) Thank you for visiting JD! This looks wonderful as a dip....but I think it would also be great as a Mexican Bull's eye pizza....I would just use regular pizza crust or croissant rolls flattend on a pizza pan and baked and then layer the ingredients on. Wow - I had never considered doing it as a pizza. What a wonderful idea! I think I'll have to try that soon! 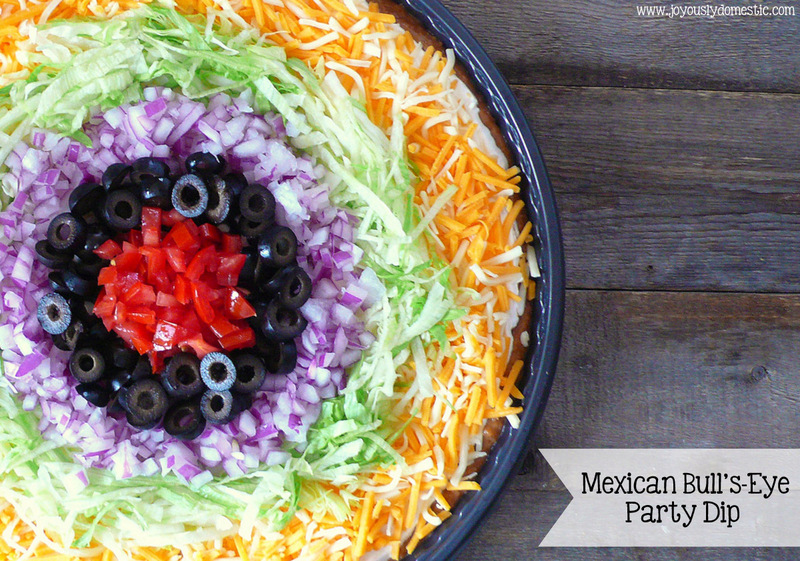 We love it as a dip ... but, I also usually love any type of Mexican-style pizza. Thank you for sharing that idea!